Artist and archivist exploring the U.S. during school breaks with my boys. If you're coming from the North/East side of Yellowstone, this is a great campground to grab a last-minute spot. As with most of the first-come-first-served campsites, in the busy months you'll have to get here at 7am or so and wait for them to post any available sites at 7:30am. You can check Yellowstone's website to see what time the campground filled up the day before to get a better idea of how early you have to be here. The campground itself isn't fantastic. It's small (which is a bonus) and mostly filled with tents and smaller trailers, so fairly quiet. Some sites are better than others. But what is great is the location and the price. For $15 you get to be right off the main "loop" of Yellowstone and it's a great staging area for seeing the rest of the park. Okay okay, I probably shouldn't give this campground a full 5-stars. After all, it's expensive ($90 and up), and the sites are teeny tiny driveways with no room between them at all. But this place is FUN. Every little nook and cranny is well designed. You can walk to a beach. They have movies, a pool and hot tub and cozy little hang out spots. They really made the most of what is essentially a parking lot and I can see why someone would want to stay for a while or return year after year. Pros: Just about everything said above plus a great lounge area (with PlayStation and shuffleboard), nice staff who will even help you park your RV, and generally a happy vibe all-around. Cons: In addition to the steep price, the immediate neighborhood is not that great. 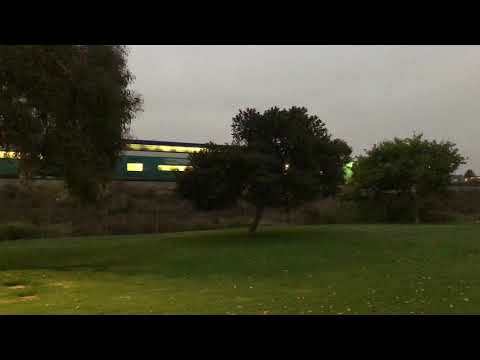 There's a loud train that goes by (though I could not hear it in the RV) and the spots are the tightest ones of any campground we stayed at on our whole trip. The walk to the beach goes under a freeway and past some not-so-great spots. I loved this campground! Would go back in a heartbeat. This was the first KOA I've ever stayed in, and I was worried it would be too cheesy/boring (in comparison to the forest/state/national park ones I tend to love), but it was totally fun. Pros: Lots of clean bathrooms, warm swimming pool, lots to do including a whole forested area with swings, a fort, etc., games, ping pong, decent sized sites. Close to the entrance to Lassen Park. Cons: Some tent sites were better than others. My favorite tent sites were T6. T7, T8 and especially T13. I love this little campground. There's ten spots on the right that are all pull-throughs (for tents or small trailers). The sites don't have a ton of privacy, but they have tables and such, enough room (some are much larger than others), and half of them are right overlooking the Lewis River. On the left side there's another eight walk-in campsites, most of which have lots of privacy. The walk-in sites are a very short walk from the parking lot, so unless you need your car or trailer, they're a pretty great way to go. And finally there's a day-use area just a short walk away with absolutely amazing views of a sweet waterfall. There's pit toilets, but bring your own water. I've read horrible reviews about the "camp host" on other sites, but we didn't have any interaction with her, so I can't say anything for sure about it and our time there was lovely. Tips: Bring exact change in cash. When we were there it was $12 for a campsite. More Church Camp than Campground. While yes, this spot is technically open to the public, the Lewis River Campground Community of Christ (unsurprisingly) feels much more like a summer or church camp that the same groups go to over and over again each year. Slightly run down cabins but with some nicer, newer buildings as well. Available to rent for events such as family reunions, I tend to prefer spots you can swing by and grab a spot last-minute among other campers, and this is not that at all. Just off the road and not far from the Lewis River, if you're looking for more-campground/less summer camp, try any number of other state and forested campgrounds in the area. Campground Review: 5/5 Stars. Perfect Spot on Cliff Overlooking River. This was our favorite spot on our recent central-Washington camping trip. We pulled up about 7pm and grabbed a huge spot with a peekaboo view of the river. When we were there, all spots were $30 and included water and electricity. While there's not a ton of coverage between sites (trees, etc.) the sound didn't seem to travel, so the folks happily playing board games and playing Prince didn't keep us up and in fact contributed to the overall happiness of the spots. Clean bathrooms, soft grass, beautiful views of the river. There's a boat launch and I'm sure this is a very popular spot in the summer. As it was, it was perfect for a Spring get-away. Tip: Visit the nearby Ginko Petrified Forest state park. Free, nice exhibits, and even some petroglyphs, which my older son especially loved. 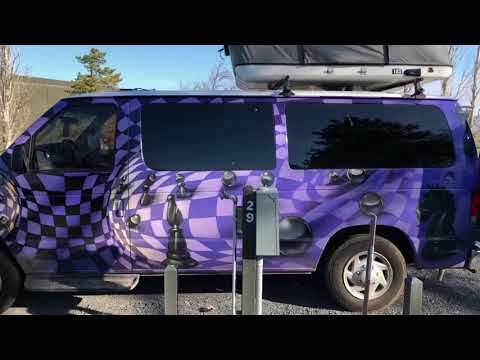 Escape Campervan Review: 5/5 Stars. Lots of Fun! Last summer my family won a vacation rental with Escape Campervans, so we decided to use part of our credit for a three-night trip over Spring Break. We drove up from Portland to Seattle, and while most people head west toward the lush Olympic National Forest, we wanted to try something different, and instead headed east for a loop through central Washington with stops in Snowqualmie Falls (famous for its part in Twin Peaks), Roslyn (home of Northern Exposure) and the oldest saloon in Washington with a 23-foot water spittoon, Ellensburg and the Tomahawk and Rock Ranch, Vantage and the Ginko Petrified Forest, the German-themed town of Leavenworth, and a grand finale in a 90-degree indoor swimming pool in Bothell, Washington. All-in-all, a great trip, and we'd definitely rent from Escape Campervans again. Here's some of what we learned. Even though I'm used to driving a large-ish SUV, I was still worried that the large campervan would be a steep learning curve. It was actually quite easy right away. I fit in every parking spot on the trip that I tried, backed up easily with the help of the back-up assist (basically a beeping noise if I came too close to anything), and went through drive-throughs and moved in and out of traffic with ease. Having previously driven both a large RV and a car towing a trailer, I definitely prefer the stress-free ease of the van. We ended up driving 500 miles total in four days, and spent almost exactly $100 on gas. Looking at our receipts, we averaged 14.5 miles per gallon driving mostly through mountains on a combination of highway and small-town roads. * Camp chairs: Not something we used. We either stayed at campgrounds that already had picnic tables (state parks), or stayed places we didn't really want to hang out (a casino parking lot), so the chairs did not get used. * Bedding: I LOVED this option. We brought along our own pillows and sleeping bags as well, but this bedding was huge, warm, soft and smelled great. I almost always am sensitive to sheets in hotels and such, and wasn't expecting much, but this was a great add-on that I'd definitely do again. * Extra Propane: We only ended up cooking once the whole time, so getting a total of two propane tanks was overkill for us. * 100 miles per day: This was definitely worth pre-paying for the 100/miles per day (we even went over that). * Heater and electrical: This heater and electrical is a maybe. Yes, you can have the space heater inside your van running at night safely, as long as you have an electrical hookup, and we actually even put it up in the tent for 20 minutes one night to warm it up. But you can also just run the van's heater with the engine running for 10-20 minutes before bed as well, and be just as warm, especially if you get the bedding from them. * Dishes: More of a personal choice. I think next time I'd just get paper plates and such, rather than wash the dishes, but that's obviously up to each individual. Pros: My boys had a blast riding around in a van with a couch and table, and the roof-top tent was equally fun. Being self-contained was lovely, as was the surprising ease of driving the van. We were also much warmer and more comfortable than we would have been sleeping in our tent. Cons: The main difficulty we had was converting the van from daytime to nighttime. We brought way too much stuff, and the grounds where we were camping were often wet or snowy, so it was a bit of a logic puzzle to move everything around, convert the chairs into a bed, add all the bedding, and get even more bedding up into the rooftop tent. We got much faster the more times we did it, but it still took between a 1/2 hour and an hour each night to fully set up. I think this would be much easier in the summer (with less bedding needed), or with the slightly larger van where the bed can stay together while driving (though then you lose the cool table and couch). Conclusion: All-in-all, definitely a fun addition to our road trip and one we'd do again in a heartbeat. Friendly. Nice Bathroom. Loud location. This KOA has some very strong positives, and almost equally strong negatives. Positives: Super-friendly manager/owner. We were about 1/2 an hour after closing, and she was still there and helped us get set up. Everything (including bathrooms) was very clean. Nice playgrounds, and we were right on the river, which was nice. Probably a nice spot in the summer (we were there when there was still a little snow on the ground). Oh, and the price was great: about $22 for three of us in a tent (non-electric) spot right on the river. Negatives: The location, while convenient to the freeway, was super-loud. It's at the confluence of two freeways, and a frisbee throw away from either. Semi-trucks shined lights into our tent all night long, and the noise was pretty bad, even with earphones. 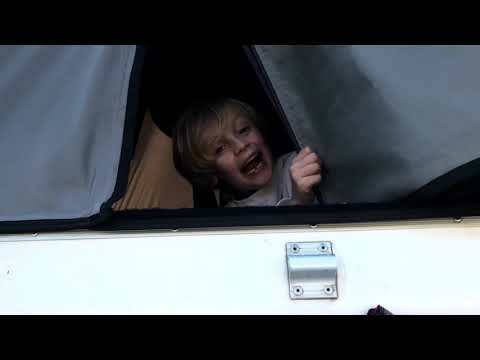 The boys slept inside the campervan, and it didn't bother them at all, so probably much better if you're inside an RV. The tent side of everything also was a little sketchy in March (to be understood I suppose…the RV side was packed), with two other folks who seemed to be sleeping in cars or under tarps. Okay Campground. Great Day-Use Area. Just past a random industrial and office park area and right on the river, Wentachee Confluence State Park is a very large, flat, grassy area with plenty of room but very little privacy between sites. Bathrooms are clean if older. Lots and lots of green grass (often covered by Canadian Goose poop). Sprinklers are on a schedule timer (certain days), which means that tents can't go on the grass. Some sites had lovely water views. There's extra parking available as well as several pull-throughs. All-in-all, the campground was nice and felt safe, but not that exciting. The day use area, however, was pretty great and just a short walk from the campground. It included a boat ramp, seating on the river, tennis courts, picnic tables, and a very nice play structure. I have no doubt this place gets busy in the summer, though when we were there in March is was well used already and the campground was probably 70% full. Tip: Great place for kids to ride bikes with plenty of paved pathways between the campground and day use area. Nice State Park with Plenty to Do. Lake, Hiking, Store. This is a very nice, typical Washington state park with plenty of trees, greenery, hiking, pathways and even a lake. There's a camp store along with several large outdoor kitchens that would be good to use for groups. Many of the structures like the kitchens and even bathrooms were built back in the 1930s by the CCC, which is pretty cool. It's just far enough off I-5 to not have the freeway noise, but close enough to be convenient. It's also nearby to Great Wolf Lodge if you're looking for a place to stay near there. On the other hand, the RV sites especially are basically in a big field with a cement road going around it. The sites have tables and fire pits, but no privacy what-so-ever. The tent sites are slightly better, with more trees, but still very close to one another. The campground also has glamping available (canvas permanent tents) that looked cool. Friendly, family-run wooded campground with pool. Many full-timers. In general, I tend to avoid campgrounds where the majority of spots are taken by full-timers, preferring state parks and such. But this is nice and friendly enough, despite having many RVs and such that look like they've been there for years, that I wouldn't mind staying at while "passing through." Nice, clean store at the front of the property including the cheapest gas in the area. The woman and her young daughter working at the front desk were super-nice and helpful. Camping and RV prices were very fair for the area ($20-$30). Tent sites, as well as the swimming pool, are only open during the summer. With just seven campsites, I liked the feeling of seclusion you might get similar to the dispersed sites further down the road, while still having a relatively clean pit toilet and garbage available. Kind of the best of both worlds. I also liked that it was $15 (vs the $20 of Henry Rierson nearby). It's first-come, first-served, and sites really do matter, so it's worth looking around or coming early or before the weekend to make sure you get a good one. Site #1 is literally a small turn-out on the road and worth avoiding, while other sites (like 4/5/6) are much larger, more secluded, and on the water. Sites 5 and 6 are also perfect if you have a group and want to share/go back and forth between the two sites. Site #7 is another one that's right on the parking lot and fairly small and worth avoiding if possible. I'd probably give this one a 3.5 star rating since the larger sites are nice, but not a ton to do other than hang out in/by the river. Clean, nice, semi-wooded campground with plenty of water to play in and places to run around for kids. Sites are available on a first-come, first-served basis, and there were still a few sites available when we arrived early-ish (10 am or so) on a Saturday in June. There are both tent and RV sites on both sides of the road. The river-side has more camp sites and some are practically right on the river. There's also a smaller creek that runs through the campground that feeds into the larger, wade-able river. While I had read tons of great reviews, I think my experience overall was more "meh." Yes, the sites are pretty, clean, and the river is lovely, but it seemed a little crowed or at least that the sites were too on top of each other (though I may just being extra picky with so many other amazing campsites in Oregon). I also wasn't thrilled with the road running through the campground. With mostly pit toilets (one flush one) and no showers, I thought the $20 per night fee was slightly expensive when there were other primitive sites down the road a bit for free. Overall, worth trying one more time due to its proximity to Portland. Have you ever wanted to sleep in a fun, wooded, semi-abandoned campground? Well come on over to the Indian Henry Campground in the Mount Hood forest on the Clackamas River. Originally host to nearly 100 campsites, an amphitheater, and a dozen toilets, much of the campground has been closed since about 2015 due to root rot. Now it’s down to about one loop and one bathroom. We arrived on a Sunday night and found a nice spot right near the river. Our site had the usual wooden table, a fire pit, and a medium amount of privacy, where people could see their neighbors but also were surrounded by huge trees everywhere. The Clackamas river as it ran through here is perfect for splashing, wading and finding beautiful rocks. It gets a little deeper and faster in the middle, but it’s also very very cold, so we stayed mostly at the edges. My absolute favorite part of Indian Henry was exploring all the semi-closed areas. Dozens of campsites were starting to be reclaimed by the wilderness but still semi hike-able if you like looking around. There’s also a smaller creek, tons of huge trees toppled over to climb on, and an old amphitheater. So many places for kiddos and their curious parents to wander around. 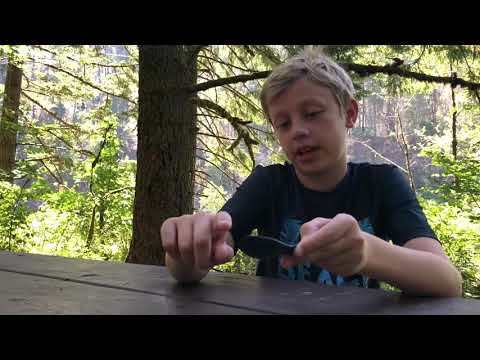 As a ranger for thedyrt.com our family were able to try a sample of humangear products including three of their utensil sets: the Uno, Duo and Trio, which are their fork, knife, spoon and toothpick combinations. In general, all are solidly built, pleasant to use, and hold up to the extensive abuse our family has put them through. Each set also has their own best use. Uno: The Uno is a cute little spoon/fork combo and the simplest of the bunch. It also has the most colors. At a price of just a few dollars each and super-portable, it’s easy to picture picking up a set of ten or a dozen of the unos in different sizes to stock a trailer kitchen or camping kit. Duo: The Duo is probably our family favorite, and the one we use most often. With a fork/spoon combo that slides in one direction for storage and another to extend into two utensils, I’ve packed this one up at least 100 times into lunches and it shows virtually no signs of wear and tear at all. Trio: The Trio is the only set that comes in its own box and is thus by far the largest for transport. This is not a set you’d buy a dozen of to stack up for a trip, but rather a combo of fork, spoon, knife (with bottle opener) and toothpick that becomes your one special set to wash and use over and over and then store back in your multi-day camping backpack. The ability to eat messy chili or cream cheese on the trail for lunch, pack it up, and then wash everything later when back at camp is where I think this set shines. The toothpick is not something I personally use, nor is the bottle opener, but I did tend to use the knife a decent amount for spreading things like peanut butter. That said, when it was something I needed cut up for eating such as an apple, I most often used my incredibly sharp leatherman knife instead. So while the case and knife are a nice addition, in general the Trio has been more novel than practical in comparison to the Uno and Duo. Lazy Bend is a small, nice, basic National Forest campground on the Estacata River. Just off Highway 224, there’s maybe 20 spots or so with a couple of bathrooms (with flush toilets). Each site has a picnic table and fire pit, plus a couple water spigots near the bathrooms. The sites have a medium amount of privacy, where all of them are pretty much visible from the main campground road, but there’s also trees between most spots. Almost all sites also have river views or easy access down to the river. Spots are $23 each for up to one vehicle, which seems reasonable for the nice waterfront location and facilities. Overall, a fun little spot to hang out and play in the river for a day or two that’s an easy drive from Portland with some lovely views. Not a ton to do at the actual campground if you’re looking to entertain kids since it doesn't have organized activities such as ranger programs, playgrounds etc., though fishing might be a good option if you’re interested. Several years ago we received a set of GoBites from humangear. This is basically a plastic nylon fork/spoon set that slides together for portability. The faces of the spoon and fork are fairly wide and rounded, so they function almost interchangeably as sporks if needed. For the past three years we’ve used these on an almost daily basis in kids' lunchboxes to eat whatever random food happens to be in the thermos, and they’ve held up incredibly well and functioned pretty much perfectly. We’ve sent these through the dishwasher on the bottom rack, occasionally used them as mini spatulas in frying pans, and generally used them frequently and well. Recently we received another set of the same GoBites to try out as thedyrt Rangers, and I thought it would be fun to compare how our well-used set held up. Turns out, despite such heavy use, the old and new set are almost indistinguishable. The only difference, and only if you know exactly what you’re looking for, is there’s the tiniest little “scratches” if you hold the GoBites in just the right angle—and the scratches are really more just very fine lines practically indiscernible to the naked eye. In addition to holding up so well, the GoBites have been practical. They fit well in your mouth and are well designed. The spoon is perfect for cereal and other liquids, while the fork has sharp edges on the sides for cutting and well-formed tines for stabbing. There’s been no gross spots where old food hides and the locking mechanism between the two parts is still in perfect shape. Overall, I would love a dozen of these in different colors for all our picnics, lunch boxes and camping needs. They even look cute! There’s really nothing I’d change. Of all the campgrounds on the Clackamas River in this general area, Sunstrip is one of my least favorite because it is intentionally the most "primitive," which in this case means it has the most weeds and the grossest bathrooms. Perhaps this will help keep the crowds away? When we visited Sunstrip was about half full, so it's entirely possible that the primitive nature of Sunstrip does help keep away some of the visitors. And I do like the beautiful view of the river from many of the campsites. In general though, if you're looking for a nicer spot on the Clackamas, try any of the other campgrounds nearby.